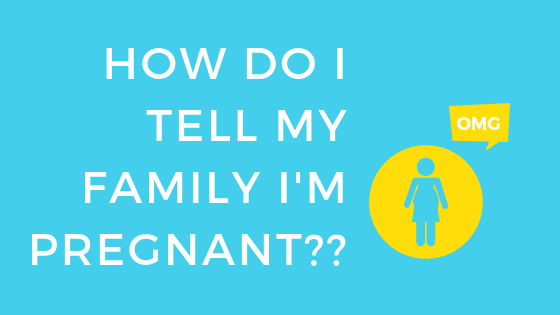 How do I tell my family I’m pregnant? Finding out the results of a pregnancy test can be shocking enough for ourselves…how do we share that news with others? Especially if our families aren’t expecting it, we might imagine the worst. But we don’t have to fear the unknown! We can prepare ourselves well for the big talk. Telling our loved ones about the pregnancy is a vital step to figuring out where to go from here. Let’s break it down into steps so we can approach our families with confidence and ease. Seriously, just take some time to relax. It’s important to enter a potentially tricky conversation with a calm attitude and an open mind. Sit or lie down, close your eyes, and just focus on breathing deeply for a couple of minutes. 2. Decide who you want to bring into the conversation. Who is important to you to include in this talk? Parents? Siblings? Friends? If the father of the baby wants to be involved, think about whether or not you want him to be a part of this conversation with your family. If it would make you more comfortable to bring a friend or two along for support, that can be a great option as well. 3. Let your parents know you want to talk. You don’t have to randomly blurt out the news. You can let your family know you want to talk about something, and from there you can both figure out a plan for when and where to talk. They may want to talk right away, or they may want to talk about it later, so be prepared either way. 4. Pick a place to have the conversation. Choose somewhere you and your family feel comfortable, like the kitchen or your room or in the car on your way somewhere (if you’re traveling, make sure you have enough time to talk). It’s important that you feel safe and at ease during this conversation, so go wherever you need to in order to make that happen. Go to a public place like a park or restaurant if you would feel more comfortable with lots of people around. Feel free to be open about how your emotions regarding this pregnancy. It’s okay to let your parents know you’re nervous/scared/excited/whatever feelings are running through you. You’ve made it this far in the process of setting up this conversation–don’t let fear get in the way of being yourself. 5. Be prepared for a variety of responses. You probably know your family well, but it’s hard to predict exactly how even the people closest to us will react to this kind of news. They may be surprised, excited, scared, upset, supportive, curious, or a combination of all of these. They may have a lot of questions, like who the father is, how far along you are, if you have any plans. Some questions you may not know the answer to, and that’s okay. You have the right to share as much or as little information with your family as you’d like. Think ahead of time about how you might respond to your family’s emotions and questions. You don’t have to have it all figured out, just prepare yourself to have an open mind. 6. Do something fun afterward. After you all have said and asked everything you wanted to, let out all that nervous energy by doing something together you enjoy. Maybe the conversation went well, and everyone is on speaking terms: you can bring them along for a fun activity. If it didn’t go as well, take some time to yourself or with some friends. Grab some ice cream, go on a walk, hit the shops, or watch an old favorite movie. Do whatever you need to do to take care of your emotional health. Hopefully, these tips give you more confidence in your ability to talk with the important people in your life. Everybody’s relationship with their family is different, so do what works well for you and them. Figuring out how to best communicate could take time and be a process, so don’t get discouraged. Just ride out the nerves, face the awkwardness head on, and give yourself and your parents grace along the way. Eventually, the conversation can turn from initial shock to how you all can best support each other during this journey. You’ve got this, just breathe and go from there! Need to talk more? Our trained nurses and counselor are ready to listen. We’re also happy to provide the resources you need so you can make informed decisions about your pregnancy. Call or click below to make an appointment today!